To individuals who are familiar with the Hindu epic Ramayana, the name Ravana has come to mean the main antagonist of the epic, the demon king of Lanka who was manipulated into kidnapping Sita, the wife of Rama. In the epic Ravana is described as the mighty king of the Raksasas with ten heads, twenty arms, and copper-colored eyes, and bright teeth like the young moon (Valmiki, Vol 2: 94-95). He gained control of his kingdom by banishing his half-brother Kubera who was the rightful king. His kingdom was the Kingdom of Lanka, which was said to be at the southern tip of India and some believe that it may be the current state of Sri Lanka as Hanuman, the monkey god, is depicted jumping over a sea to reach the kingdom. In terms of Ravana’s ancestry, he was a Brahmin by birth as he was born the Visrava, a Brahmin sage and Kaikesi, a Raksasa princess. It is believed that Sumali, Kaikesi’s father who was the king of the Daiteyas, wanted her to marry the most powerful man in the world and chose Visrava as he was the son of Rishi Pulastya, one of the six human sons of Brahma. Ravana also had quite a large number of brothers and sister, the most famous being Surpanakha, who manipulated him into kidnapping Sita because she was insulted by Laksmana and Rama; other siblings are listed as Kumbhkarna, the sleeping giant who was quite skilled at war, Vibhisana, the dharmic Raksasa who eventually helped Rama and older half-brother Kubera, the god of wealth. Even though it is said that Ravana had quite a large of number of queens and a great harem, his favorite queen was said to be Mandodari, a woman of great beauty and wisdom. Mandodari was a pious women who was always apologetic for the misdeeds of her husband. 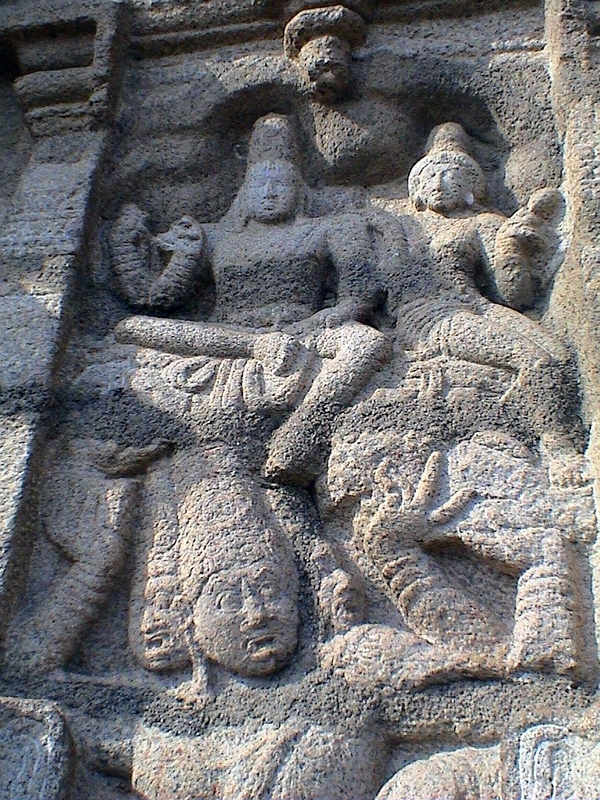 He was the father to several children; Trisiras and Indrajit, who were killed in the battle of Lanka, and Ravani, Aksa, Devantaka, Atikaya, and Narantaka. It is recorded that all of Ravana’s wives performed Sati after his death and died at his funeral pyre. In terms of Ravana’s kingdom, Lanka was initially ruled by Sumali, Ravana’s maternal grandfather. The ruling was then taken over by Ravana’s half brother Kubera, also known as the god of wealth, who was given the kingdom as a prize because of the austerities he performed to Brahma. Ravana eventually took over the kingdom forcibly, however it is recorded that Lanka flourished under his rule and after Ravana’s defeat; the kingdom was then turned over to his dharmic brother Vibhisana. It is believed that Lanka is the current state of Sri Lanka as the island of Sri Lanka is at the southernmost tip of India. There is also remains of a land bridge that connected Sri Lanka and India, which is known as Rama’s Bridge to this day, and some consider this as proof that Sri Lanka is connected to the Ramayana. In the Ramayana there are many references to Ravana’s wickedness and evilness. First of these can be seen as his defeat of his half-brother to gain control of Lanka. This was not done through normal means as he performed asceticism for Brahma, the god of creation, and a boon was granted to him for his perseverance (Pollock 509). Ravana in turn asked for the ability to defeat gods in battle and with this ability he was able to defeat his half-brother and win his kingdom. Ravana was also well known for forcing himself upon women and it is believed Kubera had cursed Ravana after such a conquest and that is why he was not able to force himself upon Sita. The greatest misdeed of Ravana in the Ramayana is the abduction of Sita who is seen as the image of righteousness. The abduction was caused by Surphanakha’s need for revenge because of Rama’s reaction after her proclamation of love as well as Laksmana cutting off her nose and ears as punishment for insulting Rama. Ravana in turn sent fourteen thousand Raksasas to Rama, Sita, and Laksmana’s dwellings yet they were all defeated. Ravana then decided to take matters further by flying to Rama’s dwellings and abducting Sita after distracting Rama and Laksmana (Kishore 1995: 69-71). As Sita was in captivity for approximately a year, during which time Ravana repeatedly tried make her his wife using many tactics; meanwhile, Rama had prepared an army of monkeys to rescue Sita. This lead to the Battle of Lanka in which the vast army of Raksasas were defeated by Rama’a army and Ravana was slaughtered by Rama himself. However, the demise of the demon king did not come easily, as Rama had to acquire extraordinary weapons in order to slaughter him, the reason for this pertains to Ravana’s boon granted by Brahma. Even though Ravana is depicted mainly negatively in the Ramayana, there are also positive aspects of his embedded in the epic. He is shown as a great scholar who mastered the Vedas and the arts as well. He was knowledgeable in Brahmin skills as well as Ksastriya skills. Ravana was also a great ruler, which was seen by the prosperousness of Lanka during his reign. When Hanuman first visits Lanka, he was amazed the “splendid yellow-white palaces, like to a city stationed in the sky” (Valmiki, Sundarakandam: 15) He also was said to be a fair ruler and this was cemented by the loyalty of his subjects which is seen many times in the epic. Ravana was a firm devotee of the destructor god, Siva and this devotion seems to stem from his meeting with the god at Kailash. It is said that Ravana may have written a devotional hymn to Siva, the Siva Tandava Stotra. When analyzing the epic the battle of Lanka could be seen as the clash of the two great devotional sects, Saivism and Vaisnavism because of Ravana’s devotion to Siva and Rama being the incarnation of Visnu himself. When discussing the great demon king, Ravana, one must always consider his positive and negative aspects. Even though he is depicted as evil and wicked in the epic and his effigies are burned even today where as Rama is seen as righteousness, one must realize that for all of Ravana’s negative aspects, positive aspects must be present as well. Pollock, Sheldon (1984) The Divine King in the Indian Epic. Journal of the American Oriental Society. Richman, Paula. (1991) Many Ramayanas: The diversity of a narrative tradition in South Asia. Berkeley: University of California Press. Rocher, Ludo (2006) The Ramayana Revisited. Journal of the American Oriental Society. Roy S.B. (1982) Mohenjodaro and the Lanka of Ravana: a new hypothesis. New Delhi: Institute of Chronology. Valmiki. Dutt, M.N. trans., Arya, Ravi. Eds. – Ramayana (Volumes I,II,III,IV)I. New Delhi: Parimal Publications. Written by Savini Suduweli Kondage (Spring 2009), who is solely responsible for its content.